What happens when you get a group of MIT-heads and MBAs to design a flying car? It looks like a plane. The Terrafugia Transition flying car is a "roadable" flying vehicle, for those tough times when a pilot just feels the need to drive. It's odd, it's ugly and it's expensive. Cheaper than a private jet, though, which might make it a more "affordable" option in these tough economic times. Retails for about $200K (USD). "Become a Sport Pilot in as little as 20 hours of flight time in a Transition®-specific course." Yikes! UPDATE Mar. 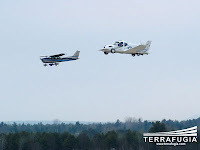 19, 2009: Terrafugia flies for the first time!